A gentle nod to my American friends and readers across the pond today. Wishing all y'all... a little phrase my Texan bestie Tammy taught me... a very happy 4th of July. A very happy day of festivities and fireworks and all things fun and aaahhh... American! We don't celebrate the day here, obviously, but I wasn't one to just let it pass without doing something in those awesome colours. I also didn't have a lot of ingredients to hand. Seems to be the story of my life lately.... I really need to restock my pantry. So this is what I came up with. 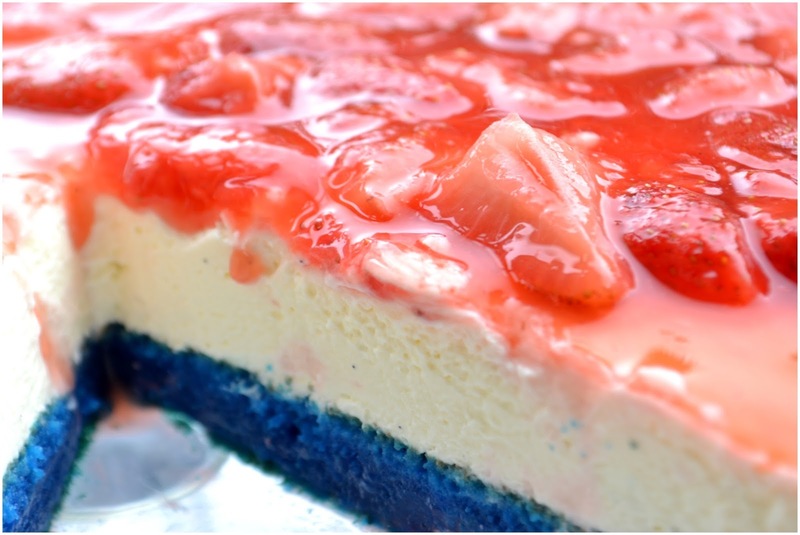 Blue vanilla cake, layered with a white, creamy vanilla no bake cheesecake, topped with a soft set strawberry eeeehhh.. topping!! I was actually quite impressed with myself for pulling this together and it working out. It look the real deal.. tastes pretty darn decent and basically that's all you need. 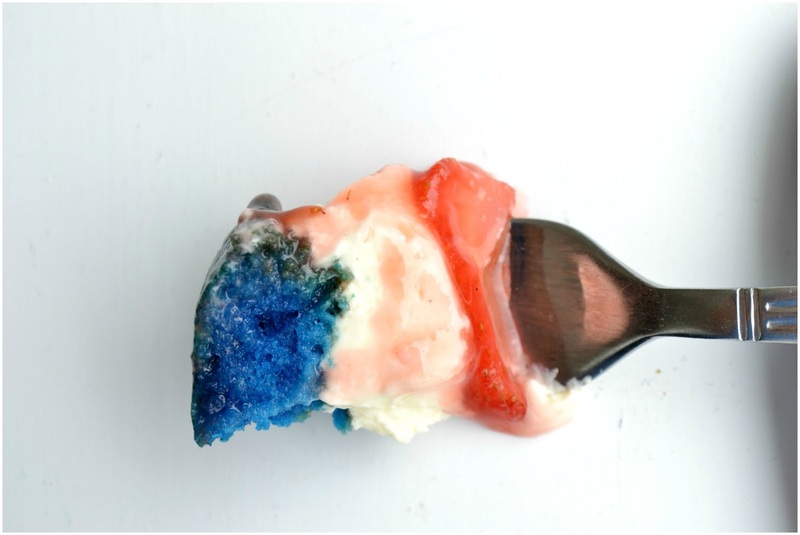 It's also in the American colours, in case I needed to point that out, and it's so easy to make! There's no excuse. 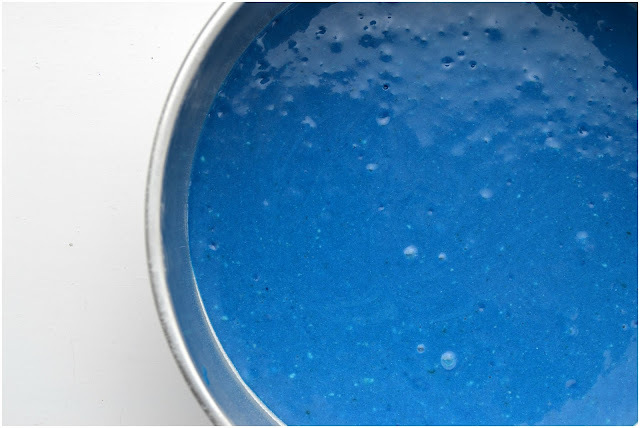 Mix the corn flour with the water. 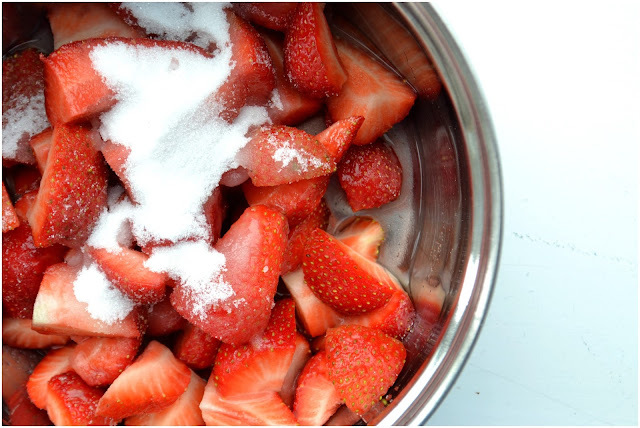 Hull and quarter all the strawberries and put them in a pot with the sugar and the water/cornflour mix. Stir to coat the strawberries. Over a medium heat let the mix bubble up, but not over boil. 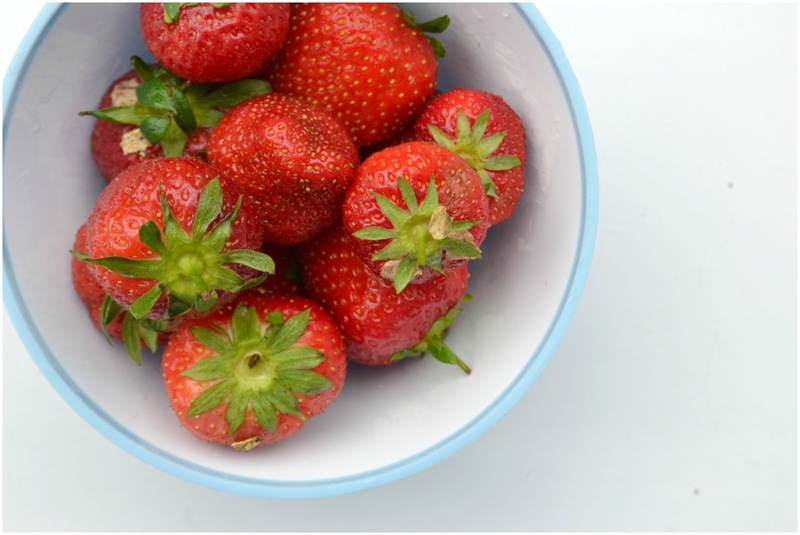 Take off the heat, pour into a bowl and all to cool to room temperature. Preheat your oven to 180C/350F or Gas mark 4. 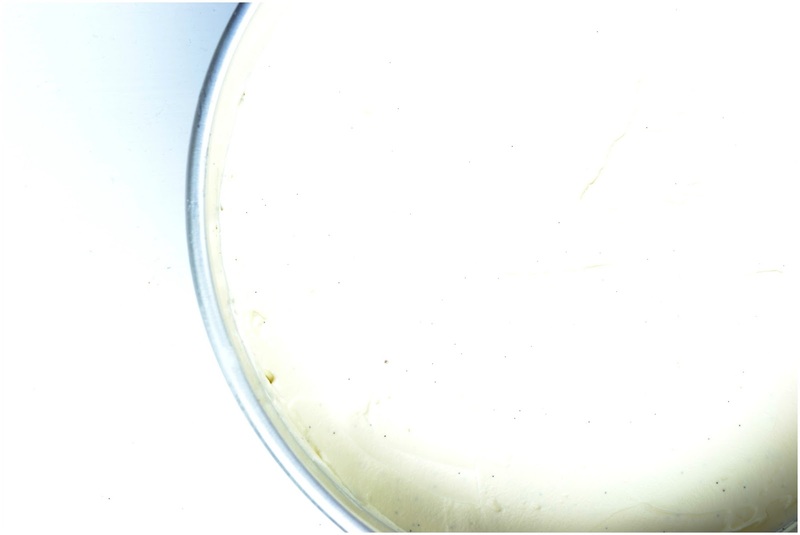 Line a 9 inch spring form tin with parchment on the bottom and spray with cake release around the sides. Beat the sugar and the eggs until light and fluffy. Add the flour and the baking powder, and give a quick mix. Follow with the buttermilk and oil, mix until just combined. Add the blue food colouring, I use gel as you use a lesser amount than the liquid colouring, to the depth of blue you want. Mine took 4 good drops. Cook for 20 minutes, until the top has slightly domed and a skewer inserted in the middle comes out clear. Using a clean cloth/tea towel, push the cake down gently so that you have a flat top. Allow the cake to cool fully in the tin. 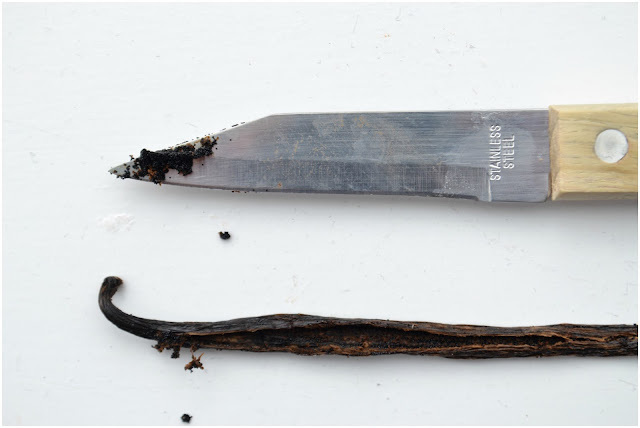 Whip the cream cheese until smooth and add the cream and vanilla seeds from inside the pod. Add the sugar and whip until thick, but still light and soft. Be careful not to over whip. 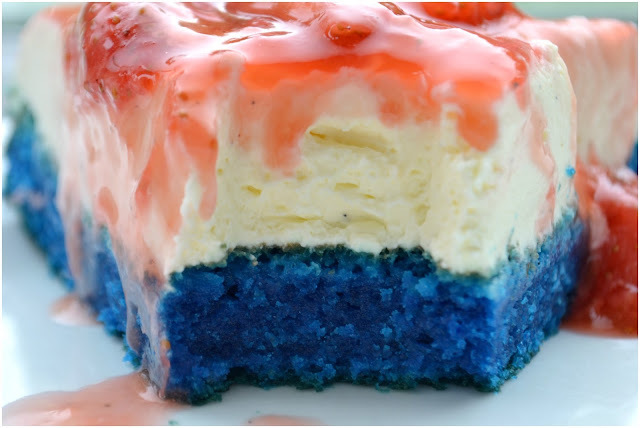 Put the cheesecake on top of the cooled, blue cake and smooth out the top. Put the whole pan into the fridge for at least two hours to set up. When you think the cheesecake has set up enough, take it out and using a hot, sharp knife, run it around the edge of the tin. Clip open the tin and gently lift it off over the cake. Pour over the strawberry topping,, cut and serve. 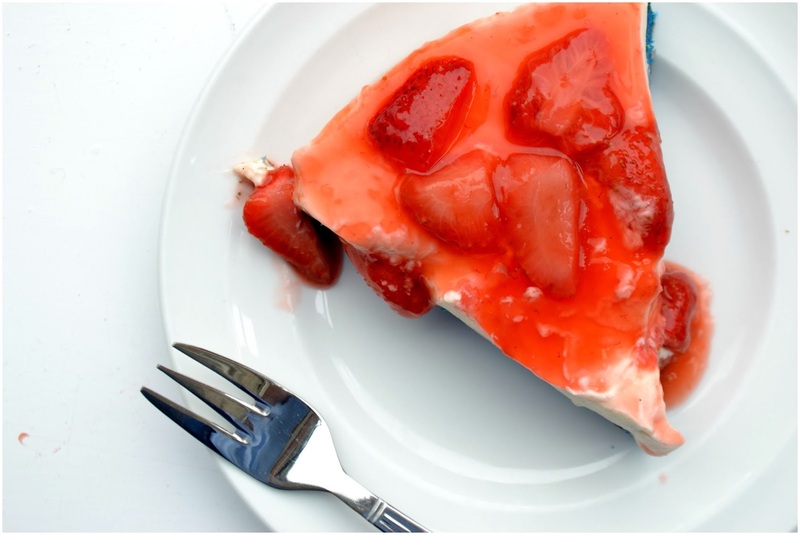 You could pour the strawberry topping in over the cheesecake, once it's set up and leave it over night. The jam parts solidify and make for a yummy, sticky topping. 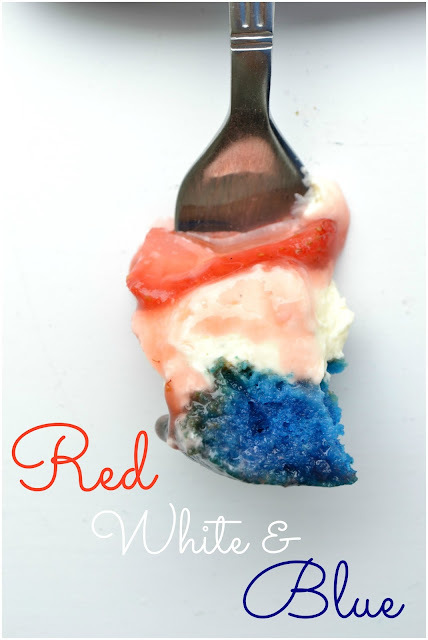 If you are needing to go to an American themed party and you want to bring dessert or you want to wow your buddies with a patriotic themed easy bake... this has got you covered!! 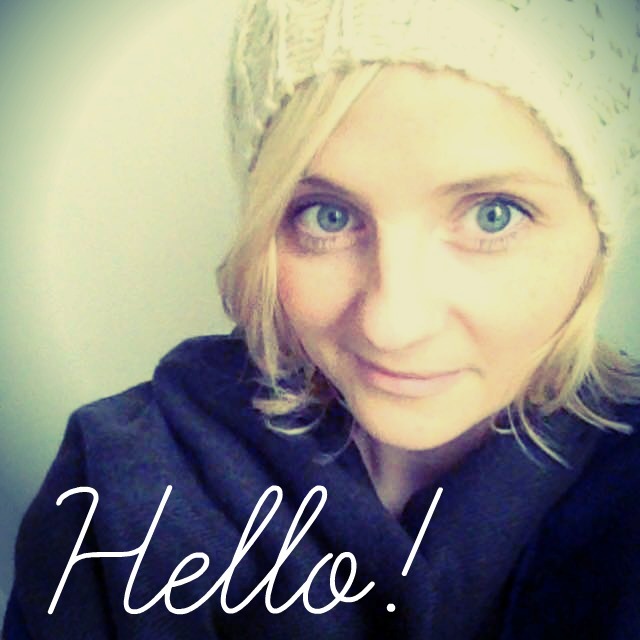 Have a good day you guys!! Be safe, mind each other.